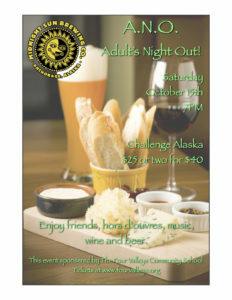 Join us for a casual get together at Challenge Alaska, Saturday, Oct. 15th, at 7pm. Meet with friends and enjoy hors d’ouvres, music, wine and beer. Tickets can be purchased here: Single ticket for $25 or two for $40. Must be 21+ to attend.